Today’s blog article has kindly been provided by Kingsley Egbuonu, Research Coordinator at Managing Intellectual Property and is about the first IP & ME meetup. Managing IP are one of our Charter signatories. 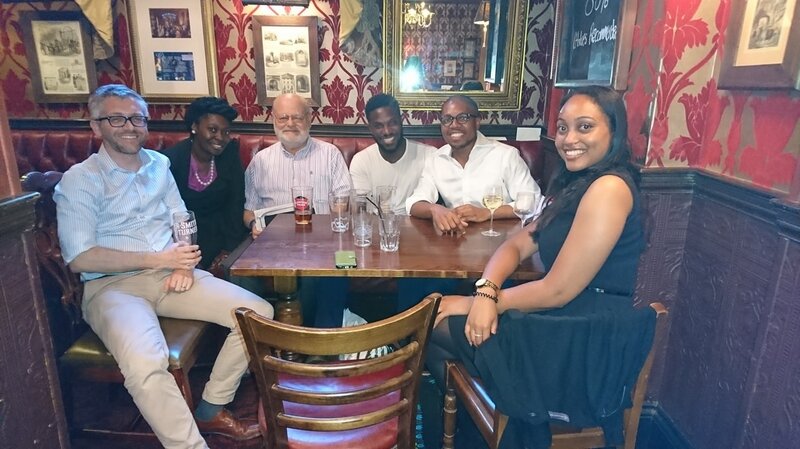 Kingsley writes: IP & ME held its first ever face-to-face meeting in London on 22 June. It was the third meeting organised by the IP & ME committee. Some members joined via telephone. We’re so grateful to CIPA and its staff, especially Lea Weir-Samuels, for hosting the meeting and being accommodating at short notice. Thank you very much. Meeting participants discussed, among other things, how to engage with stakeholders and plans for future activities. We also learned that IP & ME’s subscribers and LinkedIn group membership have grown since we officially announced its launch just over a week ago. After the meeting we went to The Old Bank of England for drinks and a laugh. It was fun! This support group is open to anyone in the IP professions who shares IP Inclusive’s values and statement of intent. The focus is on ethnic minority IP professionals. Everyone is welcome. To learn more about IP & ME and its mission statement see here.